Before joining Oh K! as Product Director, Robyn enjoyed a twenty year career in UK retail buying. She began her buying training at BHS, in multiple buying divisions, then moved on to Debenhams as a Senior Beauty Buyer, where she was awarded ‘Buying & Merchandising Employee of the Year’. 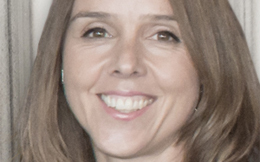 After attaining Head of Buying for Health & Beauty and Home, Robyn then joined Harrods as General Merchandise Manager, and over a five year period held the helm driving Harrods’ strategy for the Harrods Signature ranges. In 2012, Robyn took up the role of Range Director at Tom Dixon working alongside Tom Dixon OBE on retail and interior design ventures, where Robyn embarked on bringing her sourcing, range planning and commercial experience to a historically design led business. In 2014, Robyn returned to her passion of beauty and product development, joining Oh K! as Product Director, designing and supplying innovative beauty brands to over 70 countries worldwide.